Despite the strength of their ties, neither country should take the alliance for granted. This two-part piece is the eighth installment in a series on the U.S. alliance with South Korea. 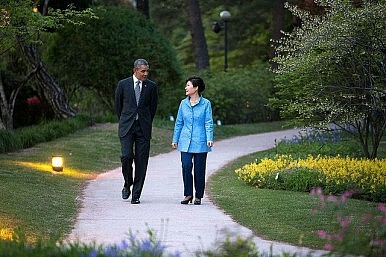 Previous articles can be found in The Diplomat’s Koreas section. Part 1 of this article, which looked at South Korean and U.S. perspectives on a post-unification alliance, showed that it is possible for the alliance to continue absent the North Korean threat, both to provide stability on the Korean peninsula as well as for geostrategic reasons. However, it also demonstrated that this is not guaranteed, and depends on how reunification takes place, and the attitudes of the U.S. and Korean people. While the two members of the alliance are key to any post-unification future, other actors in the region will play a role in the future of the alliance. This article looks at possible Japanese and Chinese perspectives of a post-unification alliance, and why it matters, and will also suggest how post-unification planning can start now. Japan’s difficult relationship with both Koreas will shape its views of any post-unification U.S.-ROK alliance. In both South and North Korea, strong feelings of ill will, and even outright hostility, are part of the legacy of Japan’s colonial history. For Tokyo, the vision of a unified Korea, possibly with nuclear weapons, as a dagger pointed towards Japan is a nightmare scenario, especially if in the aftermath of reunification Seoul aligns with Beijing instead of with Washington. For this reason, Japan has a strong incentive to want the U.S.-ROK alliance to remain strong after any reunification scenario. The president of Japan’s National Defense University, Masashi Nishihara, articulated this view, saying, “Japan seeks a united Korea that is friendly to Tokyo and Washington, that is economically viable and politically open, and will allow token U.S. presence to remain.” Beyond fear of a unified Korea hostile to Japan, the possibility of a nuclear powered Korea is a major concern. If a unified Korea inherited North Korea’s nuclear weapons, or developed new capabilities, Japan would be strongly incentivized to develop its own nuclear deterrent rather than become the only power in the region without one. If Korea remained under the nuclear umbrella of the United States, it would have less incentive to maintain any nuclear weapon capability, and the U.S. would likely not tolerate Seoul having nuclear weapons and remaining an ally. While it is clearly in Japan’s best interests for the U.S.-ROK alliance to continue post unification, it is possible that a united Korea could align more closely with Japan even if the U.S.-ROK alliance ended. As Victor Cha notes in his book Alignment Despite Antagonism the ROK and Japan are “quasi-allies” whose cooperation waxes and wanes based on perceived levels of U.S. support. In this argument, Japan and the ROK cooperate most closely when U.S. commitment to the region is least secure. If this mechanism continues to work in the wake of reunification, Seoul and Tokyo relations would improve. Another interesting possibility is that in the aftermath of reunification, historical memories of China’s involvement in the Korean War, or in maintaining the dictatorial Kim regime, might be more potent in Korea once they share a long land border with Beijing. Following reunification, Japan, along with the United Sates, will be able to play an important supportive role by providing both short-term humanitarian aid and longer-term development aid. For Tokyo, supporting Korea during this process could be a way to overcome its colonial legacy and build a new one based on helping rebuild northern Korea. But rather than waiting for Korean reunification, Japan should work at strengthening its relationship with South Korea. This would be a difficult prescription to fulfill, and would require some effort on South Korea’s part as well. However, it would be in Japan’s best interests to try to leave its WWII and colonial legacy in the past, rather than exacerbate historical tensions for domestic political reasons. Japan and South Korea, as two strong liberal democratic states with extensive trade relations, are natural partners. It is to Japan’s benefit to form stronger ties between both the United States and the ROK now, so that this framework can remain in place even without the North Korean threat. No matter how Korean reunification happens, China will play an indispensible role. China is the DPRK’s only strong ally, and is currently propping up the regime with subsidies and aid. According to Nicholas Eberstadt, China has provided North Korea, since the 1990s, with 90 percent percent of its energy imports, and according to other estimates provides 45 percent of the DPRK’s food imports. Chinese does not support North Korea out of deep friendship but on calculations of strategic interest. If Korea unifies, how China reacts to having a democratic U.S. ally across the Yalu River will potentially shape the dynamics of East Asia. The biggest concern revolves around the time immediately after reunification. If it takes place after a collapse of North Korea – as opposed to a “soft landing” reunification that occurs through political dialogue – it is unclear how China would react. Currently there are signs that China has come to accept U.S. troops in Korea as a stabilizing force on the peninsula, but there is very little chance that this understanding would last if Korea unified and the source of potential chaos and violence disappeared. China believes, reasonably so, that a major purpose of American troops is to contain them, but the North Korean situation provides a plausible deniability context for the United States. After a unification of the Korean Peninsula, it will be harder to justify maintaining tens of thousands of American troops in the Pacific without directly mentioning China. Other plausible threats, such as piracy, simply would not require such a large presence. The view that China would be hostile towards a unified Korea that remains a strong American ally – especially one that has American troops stationed on its territory – is widely accepted, including by this author, but there has been some shadow play regarding Beijing’s true feelings. It is an open secret that despite the strong alliance between the DPRK and the PRC, and the DPRK’s dependence, the relationship is troubled. China increasingly views Pyongyang as dangerous and difficult to control. In 2010, leaked diplomatic cables had Chinese officials telling their international counterparts that Beijing could live with a unified Korea. According to the leak, Chinese officials told Chung Yung-woo, the then the ROK Vice-Foreign Minister, that North Korea “now had little value to China as a buffer state,” and that a unified Korea would be acceptable as long as U.S. troops stayed in southern Korea. It is unclear how widespread these sentiments are in Beijing or even in wider China, also Chinese actions show that they still value maintaining the DPRK as a buffer and are actively propping up the regime to ensure that it does not fail. Without North Korea, or in the immediate aftermath of a North Korean collapse, the chances of conflict between the United States and the PRC possibly will rise if the two giants end up touching on two different sides of the Yalu River, leaving Korea forever a shrimp between two whales. According to prominent offensive realist thinker John Mearsheimer, as China continues to grow economically and militarily it will seek to establish a regional hegemony in Asia Pacific and push the United States out. Following this framework, smaller states like Korea, Japan and others will join with America to balance against a rising China, but this will increase the chances of conflict. Under this scenario, maintaining current American alliances will be a threat to China and vital to America for maintaining its current role. Because of this potential for conflict, planning, discussion, and transparency about intentions should start now. China’s unwillingness to discuss these issues openly is understandable, but there should be efforts to bring them up discretely with the Chinese while openly stating America’s friendly intentions in East Asia and in Korea. This effort should not only be bilateral between the United States and China, but should also include South Korea, and emphasis should be placed on the ways that China can benefit from having a more stable and prosperous neighbor. Korean unification could be a source of chaos or a source of peace and stability. Reunification will dramatically alter the balance of power in the region, and depending on how it is achieved, could create a zone of instability near the Chinese border. Many factors could affect the current alliance, such as perceptions of other regional powers like China and Japan, changes in ROK society and needs, and changes in U.S. perceptions of the alliance. The best way to keep the alliance strong is through planning and transparency. The United States has made a significant investment of treasure and personnel on the Korean peninsula; to continue benefiting from this in the future, flexibility and farsightedness are necessary. For the ROK there will be pressure to turn away from the alliance in the future from outside powers that feel threatened by it, and by nationalists within Korea. The more closely the U.S. and South Korea work together now on this planning process, the more likely the alliance will be ready to adapt to changing circumstances. Transparency is also important to show other regional powers that the alliance is not meant to threaten them, and to reduce the possibility of misunderstandings as things change. This planning process should also include Japan. As the other strong U.S. ally in the region, efforts to help Japan reconcile with the ROK will only cement the U.S. security system in East Asia. If current tensions continue, or grow, between Japan and Korea it will make it easier for outside powers to use the disunity for their own gain and weaken the U.S. alliance system. U.S. and ROK citizens are growing closer together in terms of security, economics, and liberal values, but neither country should take the current closeness for granted. Instead, they should carefully watch and maintain it.